I have three daughters. I love and adore my three daughters. If it were possible, I would move heaven and Earth for my three daughters. I hate the song "Daughters" by John Mayer. Every year, I take my oldest two children to a father-daughter dance where there are three things I can count on with absolute certainty: a brave soldier falling down while attempting the Limbo, a Dad's hula hoop contest that lasts only slightly longer than a sneeze, and slow dancing to "Daughters". Instead of feeling the swell of emotions the song is supposed to evoke, I suffer through those four torturous minutes, looking forward to better times of sliding, both cha-cha and electric. 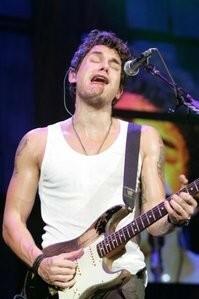 I will confess that I am not a fan of any of John Mayer's music. While it would be foolish to deny his talent as a guitarist, I find his vocals shoddy and his songwriting desperately lacking (exhibit A: "Your Body is a Wonderland"). I am less a fan of Mayer himself. In spite of his leading man looks, fame, success and fortune, he carries himself publicly like the rich, entitled, jerky character from any John Hughes movie. Yes, his list of former love interests is impressive, but the manner in which he discusses them publicly is loathsome. Getting on the wrong side of America's former (Jennifer Aniston) and current (Taylor Swift) sweethearts doesn't make him any more likeable either. "Daughters" is a sparse song with Mayer singing unaccompanied over light acoustic guitar and piano. This places all the focus on the vocals, which is not a good thing. Mayer's raspy, whispery voice has an unmistakable "hey, kid, want some candy?" quality to it which ratchets the creepiness of the song up to a full 11. A song that should be about something as pure and unquestionably noble as fathers loving and cherishing their daughters should not sound like it emanates from a man on the edge of the bed with his shirt half-unbuttoned. Taken in this context, the overriding point of the song seems to be for fathers to treat their daughters well for no other reason than to stop sending pre-screwed up girls into his life. Mayer would rather screw them up all by himself. You didn't think we'd make you listen to it, did you? There is no shortage of terrible songs out there, as a certain friend's (you know who you are) iPod will attest. Some are bad because they are patently ridiculous, ("Kitty" by the Presidents of the United States of America), some are bad because they are impossibly annoying ("Don't Worry, Be Happy" by Bobby McFerren), some are bad because they repeatedly ask us rhetorical questions ("Who Let the Dogs Out?" by the Baja Men) and some are bad because they are country songs (all country songs). What makes "Daughters" the worst song of all-time is its blatant, over-the-top disingenuousness. It is a song sung by a man with no daughters who makes a habit of breaking the hearts of other peoples' daughters. The lyrics are repetitive and inane ("she's just like maze where all of her walls are continually changed"), but in the hands of a more venerable crooner like Harry Connick Jr. or Tony Bennett, the song potentially could be salvaged. In fact, "Daughters" won the 2005 Grammy for Best Song, but this awards the writing, not the production in its entirety. As it exists, it is impossible to separate the message from the messenger. It is the equivalent of a Snoop Lion (is that really what we're supposed to call him now?) "Just Say No to Drugs" public service announcement: absurd, hollow and hypocritical. Near the end of the song, Mayer takes it upon himself to say that his message is "on behalf of every man, looking out for every girl". Thanks anyway, John, but we'll take it from here.